This super-resolution image of a small choanoflagellate colony from Mono Lake shows the flagella (magenta), actin-rich collars (green), and nuclei (blue) for every cell. "For me, microscopy is an art and an opportunity to explore a world unseen." I have 8 years of light microscopy experience in a diversity of techniques (live-cell imaging, time-lapse, immunofluorescence, fluorescent in situ hybridization, image analysis) across various microscope modalities (epifluorescence, deconvolution, confocal, super-resolution, light sheet microscopy). Large choanoflagellate colony from Mono Lake. 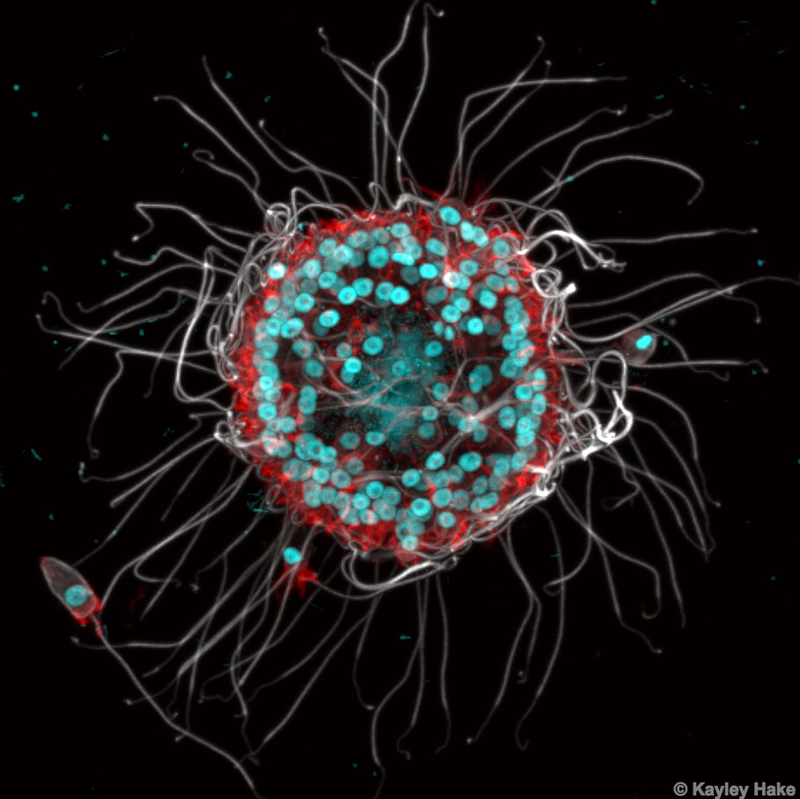 This immunofluorescence of a large choanoflagellate colony from Mono Lake shows the apical flagella (white) and actin rich microvilli collar (red) of every choanoflagellate cell facing out. Hoechst stain (cyan) labels that ovoid choanoflagellate nuclei on the periphery, as well as, bacterial DNA in the center of the colony. Egg development in blue morpho butterflies. Tile scan of a four day old sponge gemmule. Sponge development in a four day hatched gemmule in Ephydatia muelleri. Choanocyte chambers can be seen as spheres (bottom left) with the epithelial membranes expanding out. Tubulin (green) and actin (red) label the cellular morphologies of the choanocyte chambers and epithelial cells. Hoechst (cyan) stains the nuclei. This image contains about 16 choanocyte chambers from a four day hatched Ephydatia muelleri gemmule. Choanocyte chambers are spheres of choanocyte cells that resemble choanoflagellate cells in their morphology by having an apical flagellum and actin-rich microvilli collar. The center of the choanocyte chambers contain beating flagella (green) that pull water through the chambers to filter bacteria onto the actin-rich collars (red). The nuclei of the choanocyte cells are stained with Hoechst (cyan). This differential interference contrast (DIC) image depicts many choanoflagellate colonies and their variable size. The center of the colonies are packed with bacteria. Choanoflagellate colony with its associated bacterial community. This is a fluorescent in situ hybridization image labeling the bacterial communities of a choanoflagellate colony. Hoechst stains the choanoflagellate nuclei (cyan), the large spears on the outside. 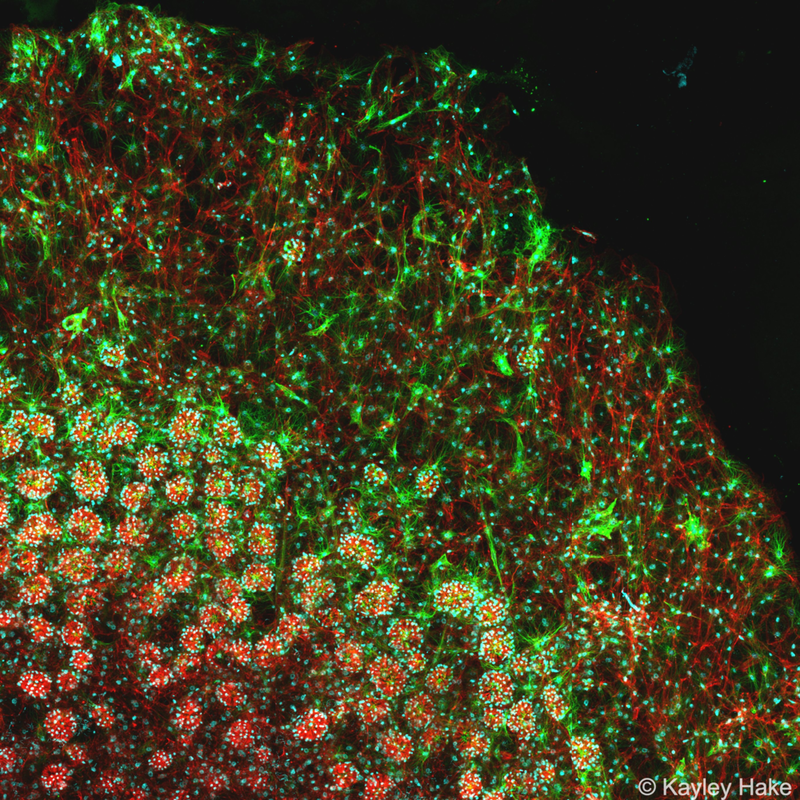 A broad spectrum bacterial probe (green) labels all the bacteria present inside the colonies. Two species specific probes (red and magenta) label individual species to show their abundance and arrangement in the community.